Low Water Pressure? Call the Experts at T.Webber for Professional Low Water Pressure Troubleshooting. There’s nothing worse than getting into a shower only to have the water reduced to a trickle. Or waiting forever for your sink or bathtub to fill. Low water pressure is not just an annoyance – it can drastically impact your quality of life. That’s where the pros at T.Webber come in. If you are struggling with low water pressure, call T.Webber. Our Plumbing & Well System experts can run a complete diagnosis on your home to determine what is causing the poor water pressure – and better yet – how to resolve it. Clogged faucet or aerator: If you are experiencing poor water pressure from an individual fixture and not the entire home, the fixture may be to blame. Checking the aerator is a simple task that homeowners can do themselves without calling in a professional. Shut Off Valves: Were you doing work around the home? If your water pressure is low throughout your house after work has been done it is possible that the shut off valve has not been fully opened. Leaks: Poor water pressure can be a result of cracks or damage to water pipes. When a pipe is leaking it can cause a drop in water pressure as all of the water is not making it to its final destination. Corroded and scaled pipes: Homes with old galvanized iron pipes may gradually corrode and clog with rust and other minerals. This buildup restricts water flow and over time reduces water pressure. Well Systems: low water pressure is a regular complaint from well systems. Our technicians can determine if there is a problem with your well pump, or if it is simply the current capacity of your system. Either way, we have the tools and know-how to improve your water pressure. 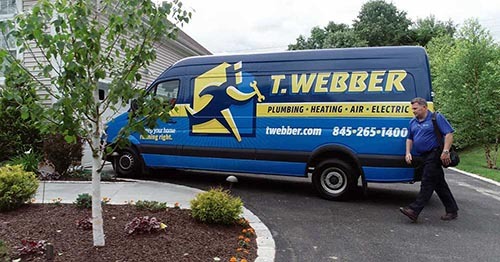 So if you are suffering from low water pressure – call T.Webber. Our Plumbing & Well Experts will work with you to solve your water pressure woes once and for all.